Bison can be viewed from outside the bison fenced units only. The bison roam across 1,500 acres of rolling land and are often not visible from the Visitor Center or roadsides. Binoculars are helpful. No hiking is permitted inside the fenced North or South Bison Units. When viewing the herd, visitors should pull off the road, turn on their hazard flashers, and park where they do not limit access to private driveways or Nachusa fence gates. In October 2014, 30 bison were introduced to Nachusa Grasslands. The herd came from three preserves owned by The Nature Conservancy (TNC): Lame Johnny Creek Preserve in South Dakota, the Broken Kettle Preserve in Iowa, and the Dunn Ranch in Missouri. Originally part of the herd from Wind Cave National Park in South Dakota, these bison have been tested and show no traces of cattle genes. The Nature Conservancy is committed to keeping bison as wild as possible, within the constraints of available space and human safety, and with minimal veterinary care just once a year at the fall roundup. The animals breed, birth, feed, and care for themselves without human intervention. Weather extremes, parasites, potential predators, and herd social dynamics are all realities for Nachusa's bison. The purpose of a roundup is to allow a veterinarian to examine each animal, vaccinate it, and embed a microchip in one of the bison's ears. The roundup is also a way to keep a current count of bison and to weigh each animal. A tunnel exists for the bison to pass from the North Bison Unit to the South Bison Unit. The bison use this tunnel frequently to go under Stone Barn Road to either the North Unit or South Unit. The general public is not allowed to hike in the South or North Bison Units. 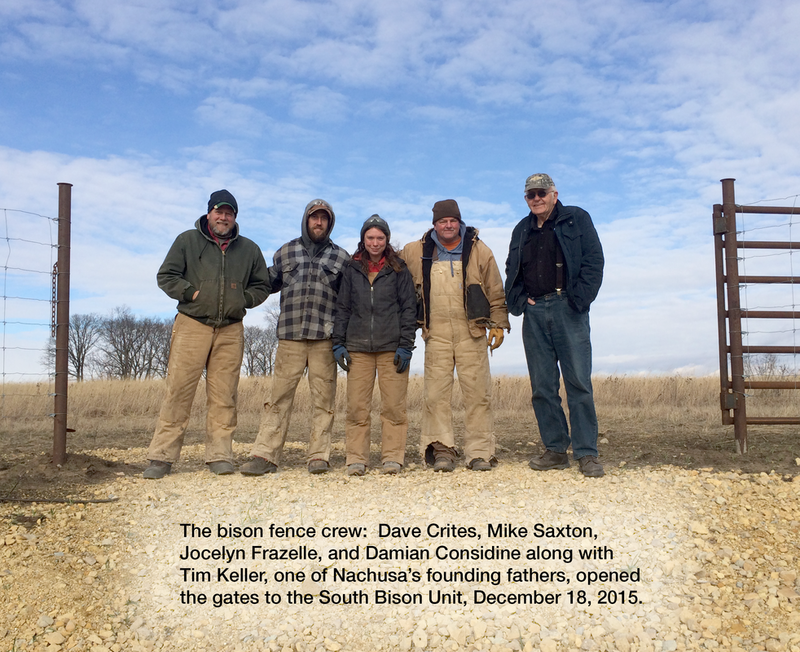 Folks can park at the new Visitor Center on Lowden Road for a possible view of the bison. Keep in mind that they can now roam over 1,500 acres, so they will often not be visible from roadsides or fence perimeter. The Visitor Center was developed by The Nature Conservancy, which will support self-guided visits of the preserve. Look at the Hiking Destinations﻿﻿ section of this website for recommended hikes. Q: What is the correct term, "Bison" or "Buffalo"? A: The scientifically correct term is "bison." The genus and species for the American Bison is "Bison bison." "American Buffalo" is also accepted. Q: How big are bison? A: Bison calves weigh approximately 40 to 60 pounds at birth. Adult bulls can weigh as much as 1,800 to 2,000 pounds, stand 6 feet high at the shoulder and be 11 feet long. Cows can grow to 900 to 1,100 pounds. Q: How long do bison live? A: Typically, bison live for 15 years in the wild and approximately 25 years when raised domestically. The oldest recorded bison in captivity was over 40 years old. Q: How many bison are there in North America? A: It is estimated that at the time of Columbus' arrival, there may have been herds of 40 to 60 million bison ranging across North America. In the 1800s, extensive killing of bison, for sport and to make way for the American cattle industry, reduced the total number to approximately 1,000. In May 1894, Congress enacted a law making bison hunting in Yellowstone National Park illegal. Eight years later, money was appropriated to purchase 21 bison from private herds to build up the Yellowstone herd. With adequate protection, this herd has steadily increased until it numbers almost 4,000 animals today. It is estimated that as many as 500,000 bison now live on private land and commercial operations, and an additional 30,000 live on public lands, including parks and preserves. A: Yes, bison absolutely can be dangerous if threatened or frightened. They account for more injuries and deaths in Yellowstone National Park than bears. Bison are remarkably fast and agile — they can run up to 35 or 40 mph and jump 6 feet high. If they want to get some place and you are in their way, you could be trampled. Bulls can be particularly aggressive during their rutting season, and cows are especially protective of their calves. In general, bison are wild animals and naturally avoid any type of human contact. Typically, they will move away from people who approach them within 100 yards. At Nachusa, our guideline is that, if bison move away from you, you are too close. A: Bison are herbivores and eat grasses and sedges. Bison do not typically eat forbs (flowers). If driven by hunger, bison have been known to eat twigs and tree bark. Q: What kind of sounds do bison make? A: Bison do not moo like domestic cattle. They make low guttural sounds which may be loud if they are startled or if a cow is warning a calf of danger. Bison can also be heard snorting. The primary way bison communicate is through body movements and various smells. A: Adult male and female bison have horns, which are typically 3 to 6 inches long. Q: When do bison reproduce? A: Bison are sexually mature at 2 to 3 years, but bulls do not typically breed until they are about 6 years old. Bulls come into their rutting season in early summer, peaking in July and August. As bison have a 285-day (approximately 9 1/2 month) gestation period, calves are usually born in mid–April to May. Most cows have a single calf. Calves spend about 9 months being cared for by their mothers. Q: What is the bison social order? A: Herd social structure is complex and always changing. In the winter months, bison form matriarchal bands (cows and juveniles) and bachelor bands of bulls 3 years and older. During rutting season, bulls compete for rights to mating, which may include charging and butting. This action does not typically result in injury. A calving cow may remove herself from the herd or stay on the edge of the herd. New mothers may form nursery bands, and mothers are fiercely protective of calves. In early spring, yearlings are weaned from maternal care and temporary yearling bands may form. Older, barren cows may also form "spinster" herds. A: Wallowing takes place when a bison rolls on bare patches of dirt. Wallowing is used for dust baths to protect bison from insects and is an important form of social interaction.